Company: HumanConcepts supports over 400 of the Fortune 500 companies with advanced organizational charts. Solution: HumanConcepts Suite delivers the premier workforce planning solution to enterprises around the world. HumanConcepts supports over 400 of the Fortune 500 companies with advanced organizational charts. To accomplish this, HumanConcepts historically supported enterprise, Flash-based web, and desktop applications. I was the lead designer on a major initiative to consolidate all of these into a unified software as a service (SaaS) solution, which leveraged the Silverlight platform. This decreased maintenance costs, expanded further into SMB markets, increased revenue with a subscription model, and substantially improved the customer experience. Ultimately, this helped solidify HumanConcepts as the de facto organizational chart standard by providing cutting-edge features in an interface easier to use than ever before. In March 2012, Saba acquired HumanConcepts to expand its hold on the human capital management market. Here’s a quick introduction to what HumanConcepts as a product solves for enterprises. I redesigned nearly the entire product during the consolidation process. I also had substantial input on the visual design and requirements along the way. Ultimately, the company saw over 65% year-over-year growth before being acquired by Saba. This is a quick introduction to the product from 2011 / 2012, which represents the bulk of my contributions. 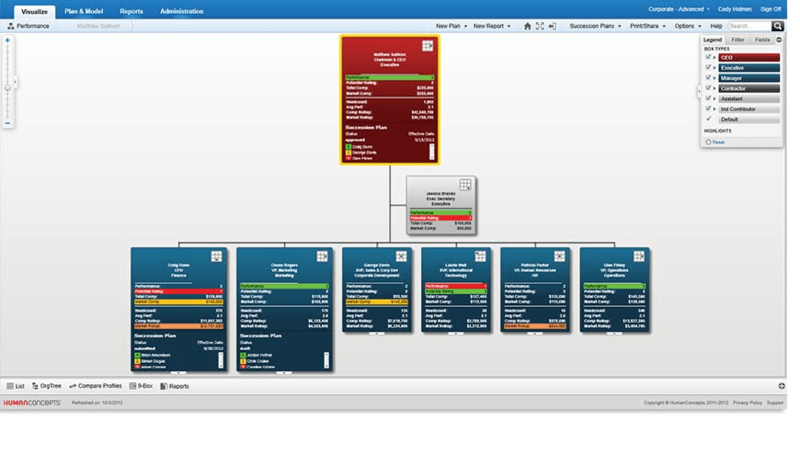 Enterprise customers using the previous HumanConcepts solution (OrgPlus) created numerous charts for every possible situation. For instance, a single manager might need different charts to review quarterly budgets, annual budgets, annual employee reviews and position vacancies. This complicated maintenance with duplicated efforts for each chart, which made it difficult to readily answer critical questions or make informed decisions. This also substantially increased the learning curve to use or create charts, because each chart independently defined style, color and organization of basic demographic information. To further complicate matters, charts used on the web-based enterprise product had to be created in a relatively out of date Windows desktop app. This application was designed by marketing and engineering without any professional UX designer; and therefore, had some pretty funky workflows. To solve these problems, we redesigned HumanConcepts (flagship product) to give chart consumers the ability to show and hide collections of data. By simply checking and unchecking boxes in the chart legend, a manager can change the duration of information shown (year to date, quarter, etc. ), types of information highlighted, or even positions shown in the chart. So, switching between budget highlights and annual review highlights might be as simple as checking a box. Field options can be toggled on/off to show and hide different collections fields (raw or calculated). Each view is a different chart with different data, representations, etc. So, with a handful of views (e.g., salary, planning, performance, etc.) and several field options in each view, hundreds of charts can be represented. This dramatically simplifies maintenance of charts, the experience of the manager, and dynamic comparison of disparate data. Views can also be scoped to specific roles or groups of users based on permissions or position within the org chart. The data is also filtered and secured on a per field basis by both role and position in the organization (e.g., managers can only see subordinate salaries). This complex security policy protects data and allows a single chart to be used by many different people… even different roles in some cases (e.g., contact information and pictures). I also simplified the expression of chart design, so a single chart is more easily reused. Organizations that previously required dozens, even hundreds, of charts to support the combinatoric conditions, may now use a handful charts and get even more insight by comparing and analyzing data in new ways without massive effort building new charts. While chart design previously involved an interface only decipherable by a select few “chart lady’s,” the new design is fairly intuitive. Anybody well steeped in the HR world can get the basics in a few minutes, and pick up many of the more powerful concepts within a few hours. Finally, we added the ability to compare two different charts. This allows comparing different views of data. For instance, comparing a performance and salary view may help a manager decide who should be promoted or allocated an additional bonus. This also allows comparing different time periods, which shows how an organization evolves over time. This is hugely beneficial in many circumstances. There were several key clients going through major, international re-orgs that identified this one feature as saving huge amounts of time and reducing risk throughout the project. HumanConcepts Suite provides rich organizational information in a single view, including org charts, profile information, lists, 9-box and more. Multi-column box layout eases communication and understanding. Gain a quick understanding of your organization, put a face to a name and share as an on boarding tool. Use the “baseball” card feature to expand on the selected employee details, conduct side by side employee comparisons. Then be kept open on the screen as you navigate through the chart. The org tree view enables you to quickly see a hierarchical representation of the workforce by using expand and collapse arrows. Use color coded highlights to alert you when employee statuses are in or out of bounds. Use built in formulas to calculate workforce metrics, for example, the diversity ratios in your organization. Managers are granted permissions to see only their team or direct subordinates relevant information. Using inherited security settings, ensures sensitive data is shown only to those with the proper rights. Compare organizational structure at two points in time to see changes, trends, compliance issues. Easily produce reports summarizing changes to the organization and key metrics. Keep employee information updated to reflect the current, correct values. Build ad hoc groups in minutes. You can use the split screen feature to search for key employees and drag them into new positions in the organization. Create, edit and share Succession Plans within the framework of the org chart. The Next Moves panel shows the readiness level for each employee and succession plans in which they’re a considered candidate. Build out your candidate selection to include any member of the organization using advanced searching capabilities. Powerful, but simple chart creation. Many success stories are driven by these powerful charts. Easy domain management, even across different ERPs. For instance, a North America domain on Oracle can be reconciled with a Europe domain on SAP, which is hugely powerful. Flexible end-user experience that removes complex components from the interface for simple use-cases. However, progressively exposes functionality to power-users (typically HR professionals). I spent over a year on this project, and touched nearly every piece of the HumanConcepts offering along the way. There were a couple contractors that helped with the visual design, but I designed the vast majority of the product IXD. The rest of the product team and engineering teams were absolutely critical to my success. Without them, I wouldn’t have been able to get access to the subject matter expertise necessary to grok such a deceptively complex industry and solve these problems (and many, many more).